Although some can be aggressive with strange dogs, the breed is quite good with other pets. Bulldog is the name for a breed of dog commonly referred to as the English Bulldog. 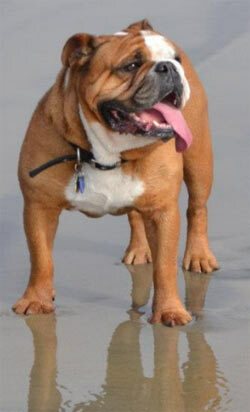 Other Bulldog breeds include the American Bulldog, Olde English Bulldogge, Australian Bulldog and the French Bulldog. The Bulldog is a muscular heavy dog with a wrinkled face and a distinctive pushed-in nose. Bulldogs have been bred in England for hundreds of years. Originally used in the 17th century for bull baiting—a wagering sport in which dogs fought bulls in a ring. Although the English Bulldog appearance can be somewhat intimidating, it is among the gentlest of dogs. English Bulldog is good for apartment life. They are very inactive indoors and will do okay without a yard. Although some can be aggressive with strange dogs, the breed is quite good with other pets. Bulldog is an easy-care breed. His exercise needs are manageable for even the most dedicated couch potato, and he doesn’t tend to be a picky eater. Healthy bulldog can live as long as 10 years, but they have a long list of hereditary health issues. Some Bulldogs suffer respiratory problems, hip/knee issues and eyesight problems.